After getting my 1st MEF certification in 2011 and getting re-certified in 2015, my pursuit for updating my knowledge still continued. At the same time I saw MEF progressing itself in multiple directions supporting the requirements of the digital economy in this hyper-connected world. MEF introduced a new look, introduced MEF 3.0 and the transformation continues. In the same year MEF introduced MEF-NF (MEF Network Foundations) certification, making it the foundation credential in a stack of professional-level certifications called the MEF Network Certification Framework. MEF-NF validates at a concept level, the key terms, processes, and elements of today’s programmable networks. With this, MEF-NF introduced new areas like SDN, NFV, LSO/Orchestration and various combinations and use cases in these practice areas, collectively called “The Software-Driven Network Vision”, in addition to Carrier Ethernet/Connectivity Services. I again volunteered for the beta test and with self-study was able to pass the exam in the 1st attempt becoming the 1st Sri Lankan to get the certification. Having completed the essential level (MEF-NF) and 1 certification in the professional level in the MEF Network Certification Framework, I was waiting for other certifications to come up. Early this year MEF introduced their next in its line-up of professional level certifications, MEF-SDN/NFV, making it the first ISO-level exam that validates individual knowledge, skills, and abilities in the domains of SDN and NFV, expertly designed to certify real-world, practitioner-level technical skills of SDN and NFV for network/telecom operators and engineers. SDN, NFV and Cloud have been my personal research areas since 2015 and I was actually looking for a way to validate my knowledge especially in the area of SDN and NFV. I planned to take OCSA (ONF-Certified SDN Associate Exam), however MEF introduced the MEF-SDN/NFV certification around the same time and MEF certification was the better option. I was able to study for the exam via self-study and passed the exam in the 1st attempt becoming Sri Lanka’s 1st MEF-SDN/NFV certified professional and the MEF's 2nd MEF-SDN/NFV certified professional worldwide. In mid-2018, MEF introduced MEF Network Expert, making it the Standard of Excellence and Recognition in Software-Driven Networking. 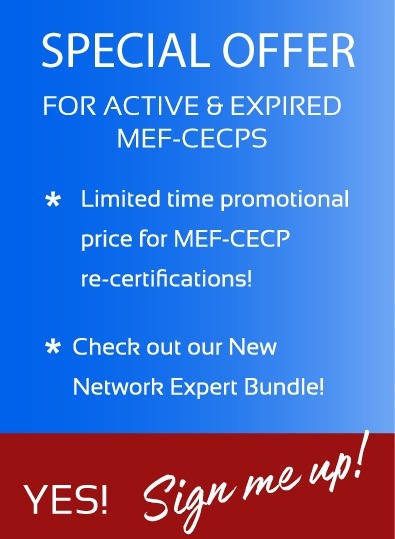 MEF Network Expert is not an exam, but a recognition and the requirement is to pass all three of the MEF Professional Certification exams (MEF Network Foundations (MEF-NF), MEF Carrier Ethernet Certified Professional (MEF-CECP), and the brand-new MEF SDN/NFV Certified Professional (MEF-SDN/NFV). Upon its introduction and acknowledgment of those who reached this achievement, I came to understand that I am the first person to pass all 3 exams, maintaining "Active" status of those certifications making me the 1st official MEF Network Expert! Next steps -> stay in-tune with MEF's strategic direction and programs, specifically MEF 3.0 Implementations projects, participate as a subject matter expert where possible, collaborate with industry professionals on MEFProCERT.com and elsewhere, speak at telecommunications events. With my 1st writing to MEF ProCERT blog I tried share my very first experiences with MEF. That was more about how I used MEF technical specifications in the early stages of my career to help me out with planning, designing and architecting Metro Ethernet and Carrier Ethernet networks and also preparing RFPs for the same. This blog is about my first experience with MEF Professional Certifications. After 2 successful implementations of a Metro Ethernet Network and a Carrier Ethernet Network, I became more enthusiastic about the technology and the work of MEF. I started learning more and also contributing to the community. I also became an author and a senior contributor to the then Ethernet Academy. In 2011 MEF introduced its 1st professional certification MEF-CECP (MEF Carrier Ethernet Certified Professional) and invited technical experts in the subject area to take the beta test. I volunteered and took the exam and with self-study, passed it from the 1st attempt becoming one of the 58 people in the world to become a MEF-CECP and also the 1st Sri Lankan to do so. I didn’t stop there. I encouraged my colleagues to do the exam and as a result 2 of them got the certification. Since then I volunteered for many MEF-CECP beta exams. In 2015, I got myself re-certified with MEF-CECP. 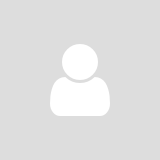 Having associated with MEF (then Metro Ethernet Forum) from as far back as 2003, I thought of sharing a bit about my experience with MEF for the benefit of everyone. Few months after joining my current company (a Service Provider in Sri Lanka) as a young Engineer back in 2003, I was asked to plan and design a network using a technology called “Metro Ethernet”. Though I had heard about Ethernet, Metro Ethernet was kind of new to me. I searched on the web and within the 1st few search results there came the “Metro Ethernet Forum”. While referring to other learning material, I extensively used the material available in MEF to learn about the foundation principles of Metro Ethernet. I found the MEF Technical Specifications extremely user friendly, compared to the documents published by other SDOs (Standards Developing Organizations). That made me to read more MEF documents. I also used the book Metro Ethernet by Sam Halabi. Having gained enough knowledge, in 2004, I started architecting, planning and designing Sri Lanka’s 1st Metro Ethernet Network from scratch and prepared the RFP (Request For Proposal) documents for product selection. The document approach and evolution was based on various IETF (RFCs and drafts), ITU-T, IEEE and MEF specifications. Two of the MEF specifications included in the RFP were MEF 8: Implementation Agreement for the Emulation of PDH Circuits over Metro Ethernet Network and MEF 14: Abstract Test Suite for Traffic Management Phase 1. As we wanted to have CESoPSN (Circuit Emulation Services over Packet Switched Networks), MEF 8 was included. We've seen a great deal of interest in SDN/NFV professional certification upon its release. The value of this certification is obvious to some however not so obvious to others. To potentially stimulate some discussion, take a look at the following table (click here). In addition to the table is an article which substantiates the value (click here). I look forward to your comments! July 17, 2018 the Unted States Whitehouse (https://www.whitehouse.gov) published a report by the Council of Economic Advisers (CEA) on "Addressing America’s Reskilling Challenge". Its an interesting read on whats happening in America, and there is a larger affect in such industries as telecommunications which have a global impact. The executive summary and full document are published here, but to cut to the chase, in America, the older workforce is retiring, and the younger workforce needs to up-skill to remain competitive in potentially shrinking number of companies. This is especially in telecommunications as mergers and acquisitions take place and workers are displaced. Those displaced are often less skilled than those who retain their jobs, however this varies by situation. The report also indicates that those who get training/up-skill do make more money than their counterparts, and this is not the only report study which indicates this fact. Additionally, companies often know what skills they need, however they aren't always on-track to make sure their employees skills meet the requirements of the company. This problem can be resolved and that's what we're setting out to do. MEF Professional Certification consists of 3 exams currently which address specific domains of knowledge rthat directly apply to todays telecommunications/IT workforce and a proven track record of proof points and successes illustrating the value of MEF Professional Certifications. Click here if you are interested in reading the full article. © 2019 ProExamServices.com | © 2019 MEFProCert.com All Rights Reserved.